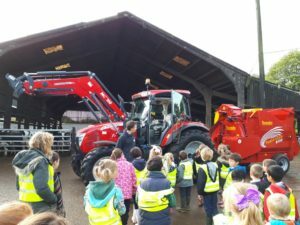 On the 12th October the whole school visited Green Farm at Downhead near Shepton Mallet to experience harvest on a farm! 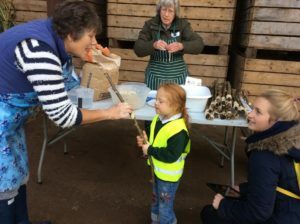 The morning was full of fun activities that raised awareness of food production and wildlife conservation. 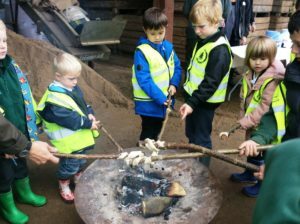 We made dampers (unleavened bread made from wheat flour) and cooked them over wood fires before devouring them with honey and jam. 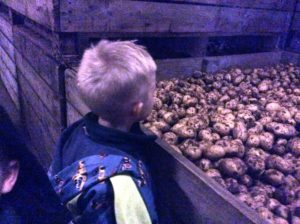 After much munching and licking of sticky fingers, we went into the barn to hear about potato production and learn about the potato sorting machine! Great fun was had exploring the cold storage area and seeing the huge towers of potato crates. 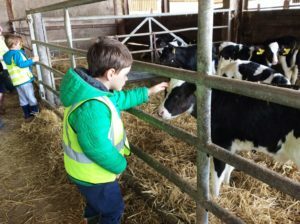 Next it was up to the calf sheds to learn about animal care and tractors. Everyone climbed up into the tractor for a good look around and petting the calves proved to be very popular! Then we learned about the importance of hedgerows and habitats while taking part in an exciting wildlife quiz along one of the farm tracks. To round off the visit we participated in a short Harvest Service. On leaving to return to school we all received a bag of potatoes grown on the farm to take home for tea! As part of our harvest thanks and celebrations we also collected food for the Frome Food Bank. 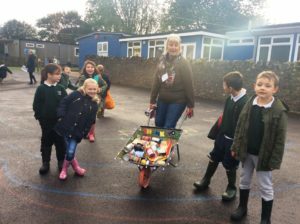 Mrs Andrews had great fun on the playground with her ‘blinged-up’ Harvest collection wheelbarrow! We would like to thank Farmer Steve Britten and his team for such an enjoyable and informative morning and Father Anthony and Rob Walrond (Rural Life Advisor for Diocese of Bath and Wells) for coordinating the visit. Special thanks must also be given to Bridgwater Agricultural Society who kindly donated £100 towards the cost of transport to and from Green Farm.